Using KDevelop 3.3.3 on SUSE 10.1 I’ve ported one of my WinMFC programs to Linux. The GUI is written with the QT3 tool kit and QTdesigner in KDevelop. 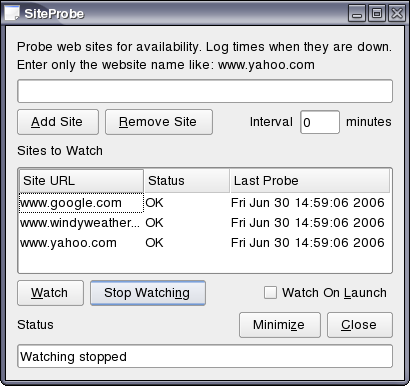 When the program is running the appropriate buttons are disabled and the program saves and restores the configuration [interval and Watch on Start] and the site list. Update: You can find the modern version of the program here.